Kentucky native Steve Kazee currently is building a Broadway legacy with his portrayal of “Guy” in the new hit musical “Once.” Based on the Academy Award-winning film of the same name, “Once” tells the story of an Irish musician and a Czech immigrant drawn together by their shared love of music. While “Once” isn’t Kazee’s first Broadway experience, it is the one that has garnered him attention and appreciation from critics and audiences alike. The show has also netted Kazee an impressive array of award nominations, including a Tony nod for Best Performance by an Actor in a Leading Role in a Musical category. Kentucky Arts Council Communications Director Emily Moses sent Kazee a list of questions and asked him to pick five to answer for Creative Commonwealth readers. Below are his responses. Enjoy, and don’t forget to tune in to the American Theatre Wing’s 66th Annual Tony Awards at 8 p.m. EDT Sunday, June 10, to catch Kazee performing live. 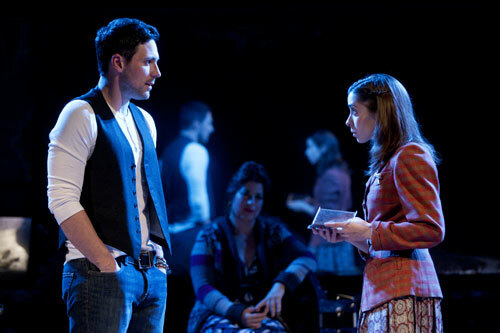 Steve Kazee and Cristin Milioti star as Guy and Girl in “Once,” currently on Broadway. Photo by Joan Marcus. Q: How can you relate/attribute your success to your Kentucky roots and experiences? Kazee: I think growing up in Eastern Kentucky, Ashland to be specific, and going to Morehead State University, was a huge positive for me in my career because it has always kept me grounded. I know where I am from. I am proud of where I am from and occasionally, when the business can inflate your ego a bit, it is good to look back and remember who I truly am and not get caught up in the hype. Fame is fleeting but home will always be home. Q: At what point did you know you would pursue a career in theater, and how did you set about achieving your goals? Kazee: I knew the first time that I got a summer stock job at The Lost Colony Outdoor Drama in Manteo, N.C., that I wanted to do this professionally. I never really had a plan. It sounds cliché, but I just trusted my heart and my gut and followed my dreams. Whenever it got bad, I just told myself that good things were on the way. So far it has worked out quite nicely. Q: It’s quite natural as you achieve one personal or professional goal, you might set another. What’s next in your career on your “to-accomplish” list? Kazee: I would like to move into doing films. It’s the one place that I haven’t really worked yet and has always been the ultimate goal for me. To be able to go to a movie theater and see myself on the screen – that’s the dream, at least – so that is the next ring for me to reach for. Q: Do you see yourself living in Kentucky again anytime in the future? Kazee: I have always said that when all is said and done, I would like to come back home and retire there. I don’t know if it will actually pan out that way. Being an actor never really lends itself to retirement. It seems like you keep doing it for as long as you are lucky enough to. I do have property in Ashland, though, so I always have somewhere to go. I might want to live in Lexington or Louisville. Who knows? All I know for sure is that I am proud to be a Kentucky boy. Q: What are you up to when you’re not on stage? Kazee: My life right now is very monastic. I get up, have breakfast, go to the gym, start getting warmed up, do the show, then come straight home and go to bed, and then start it all over again the next day. It seems much more glamorous from the outside, but trust me, it’s very banal for the most part. There are days where there are amazing things happening, but for the most part, eight shows a week on Broadway is a very quiet life. In addition to “Once,” Kazee’s Broadway credits include: Monty Python’s “Spamalot” as Sir Lancelot, Starbuck opposite Audra McDonald in the Roundabout’s “110 in the Shade,” “To Be or Not to Be” at Manhattan Theatre Club and Edward Albee’s “Seascape.” Regional: “The Subject Was Roses” (Kennedy Center, Helen Hayes Award nomination for Best Actor alongside Bill Pullman and Judith Ivey). Off-Broadway: “As You Like It.” TV/film: “Working Class” opposite Melissa Peterman, “100 Questions,” “CSI,” “NCIS,” “Numb3rs,” “Medium,” “Conviction.” Kazee has a Master of Fine Arts in acting from New York University’s Tisch Graduate Acting Program and a Bachelor of Arts in theater from Morehead State University. This is the first in an occasional series of Q&A’s the arts council will produce for readers of Creative Commonwealth. The feature will not only spotlight Kentuckians in the arts, but will provide important and useful information from artists, arts administrators, associates and educators to entertain and inform readers of our blog. Is there a topic you’re interested in reading or learning more about? Is there a person near or far you would like to see spotlighted? Leave your answer in the comments below, or contact Emily Moses, arts council communications director, to submit an idea. Please do more of these interviews, I loved it! Thanks for your comment, Will. So glad you enjoyed it. We certainly have more planned for the future.